Historically the Dalai Lamas or their regents held political and religious leadership over Tibet from Lhasa with varying degrees of influence depending on the regions of Tibet and periods of history. 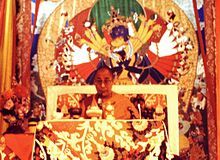 This began with the 5th Dalai Lama’s rule in 1642 and lasted until the 1950s (except for 1705–1750), during which period the Dalai Lamas headed the Tibetan government or Ganden Phodrang. Until 1912 however, when the 13th Dalai Lama declared the complete independence of Tibet, their rule was generally subject to patronage and protection of firstly Mongol kings (1642–1720) and then the Manchu-led Qing dynasty (1720–1912). In 1939, at the age of four, the present Dalai Lama was taken in a procession of lamas to Lhasa. 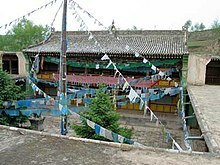 The Dalai Lama's childhood was then spent between the Potala Palace and Norbulingka, his summer residence, both of which are now UNESCO World Heritage Sites. At the Congressional Human Rights Caucus in 1987 in Washington, D.C., the Dalai Lama gave a speech outlining his ideas for the future status of Tibet. The plan called for Tibet to become a democratic "zone of peace" without nuclear weapons, and with support for human rights, that barred the entry of Han Chinese. [ត្រូវការអំណះអំណាង] The plan would come to be known as the "Strasbourg proposal", because the Dalai Lama expanded on the plan at Strasbourg on 15 June 1988. There, he proposed the creation of a self-governing Tibet "in association with the People's Republic of China." This would have been pursued by negotiations with the PRC government, but the plan was rejected by the Tibetan Government-in-Exile in 1991. [ត្រូវការអំណះអំណាង] The Dalai Lama has indicated that he wishes to return to Tibet only if the People's Republic of China agrees not to make any precondition for his return. In the 1970s, the then-Paramount leader Deng Xiaoping set China's sole return requirement to the Dalai Lama as that he "must [come back] as a Chinese citizen... that is, patriotism". 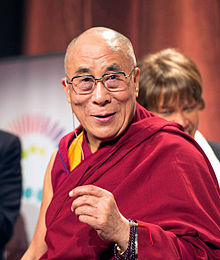 In Dalai Lama’s essay, "The Ethic of Compassion" (1999), he expresses his belief that if we only reserve compassion for those that we love, we are ignoring the responsibility of sharing these characteristics of respect and empathy with those we do not have relationships with, which cannot allow us to "cultivate love." He elaborates upon this idea by writing that although it takes time to develop a higher level of compassion, eventually we will recognize that the quality of empathy will become a part of life and promote our quality as humans and inner strength. These activities have given rise to dozens of DVD sets of the dialogues and books he has authored on them such as ‘Ethics for the New Millennium’ and ‘The Universe in a Single Atom’, as well as scientific papers and university research programmes. On the Tibetan and Buddhist side, science subjects have been added to the curriculum for Tibetan monastic educational institutions and scholarship. 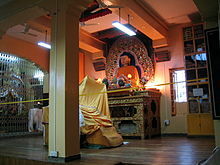 On the Western side, university and research programmes initiated by these dialogues and funded with millions of dollars in grants from the Dalai Lama Trust include the Emory-Tibet Partnership, Stanford School of Medicine’s Centre for Compassion and Altruism Research and Education (CCARES) and the Centre for Investigating Healthy Minds, amongst others. ↑ Buswell, Robert E.; Lopez, Jr., Donald S. (2013). The Princeton dictionary of Buddhism. Princeton: Princeton University Press.
. Entries on "Dalai Lama" and "Dga’ ldan pho brang". ↑ Thondup, Gyalo; Thurston, Anne F. (2015)។ The Noodle Maker of Kalimpong: The Untold Story of My Struggle for Tibet។ Gurgaon: Random House Publishers India Private Limited។ ទំ. 20។ ល.ស.ប.អ. 978-81-8400-387-1។ "Lama Thubten named my new brother Lhamo Thondup." ↑ ៦,០ ៦,១ Thomas Laird, The Story of Tibet. Conversations with the Dalai Lama, Grove Press: New York, 2006. ↑ A 60-Point Commentary on the Chinese Government Publication: A Collection of Historical Archives of Tibet, DIIR Publications, Dharamsala, November 2008: "Chija Tagtser born holy precious child Lhamo Dhondup [...] the holy reincarnate child in Chija Tagtser." ↑ Thomas Laird, The Story of Tibet: Conversations With the Dalai Lama, p. 262 (2007) "At that time in my village", he said, "we spoke a broken Chinese. As a child, I spoke Chinese first, but it was a broken Xining language which was (a dialect of) the Chinese language." "So your first language", I responded, "was a broken Chinese regional dialect, which we might call Xining Chinese. It was not Tibetan. You learned Tibetan when you came to Lhasa." "Yes", he answered, "that is correct (...)." ↑ ១៤,០ ១៤,១ Bell 1946, p. 397. ↑ ២១,០ ២១,១ Laird 2006, p. 267. ↑ ២២,០ ២២,១ Richardson 1984, p. 153. ↑ Peter Graves (host). Dalai Lama: Soul of Tibet. A&E Television Networks. ពេល 08:00. ↑ Fagan, Geraldine. "Russia: How Many Missionaries Now Denied Visas’." Forum 18 News Service. Vol. 7. 2005. ↑ HT Correspondent (7 March 2015)។ "Tibetan language must to keep Nalanda tradition alive: Dalai Lama"។ Dharamsala: Hindustan Times។ http://www.hindustantimes.com/himachalpradesh/tibetan-language-must-to-keep-nalanda-tradition-alive-dalai-lama/article1-1323860.aspx។ "The unique quality of Tibetan Buddhism is that it is based on ancient India's Nalanda Buddhist tradition"
↑ ៩៨,០ ៩៨,១ ៩៨,២ ៩៨,៣ Tenzin Gyatso (12 November 2005)។ "Our Faith in Science"។ New York Times។ https://www.nytimes.com/2005/11/12/opinion/12dalai.html?pagewanted=all&_r=1&។ "Science has always fascinated me"